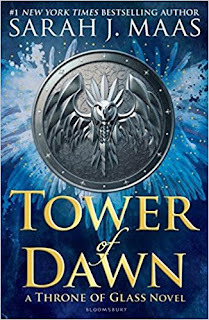 Review: I excitedly downloaded this book and after a few chapters realized...this is Chaol's story told during the same timeline as the previous book. So...no Manon. Boo! I am not a Chaol fan. He went from nice but kind of boring guy to jerk pretty quickly in the previous books. I guess this was the author's attempt to rehabilitate him. Did we need almost 700 pages to do that? I don't think so. This could have been a novella or a much shorter book. Chaol and his love interest, Yrene, were about as exciting as watching paint dry. And they way she ended up healing him....nothing exciting about that. I did enjoy Nesryn's story arc and that was the saving grace of the entire book. The only important plot point was about Maeve. I have high hopes for book #7 in this series.